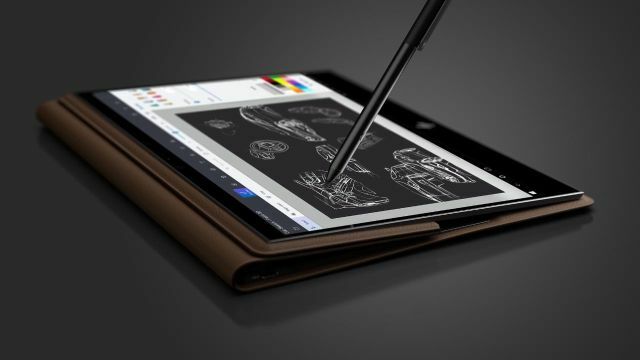 HP has unveiled an all-new Spectre Folio, a notebook that pushes the envelope when it comes to design with an all-leather exterior, LTE connectivity, a unique hybrid form factor, as well as a brand new Intel-based motherboard design. 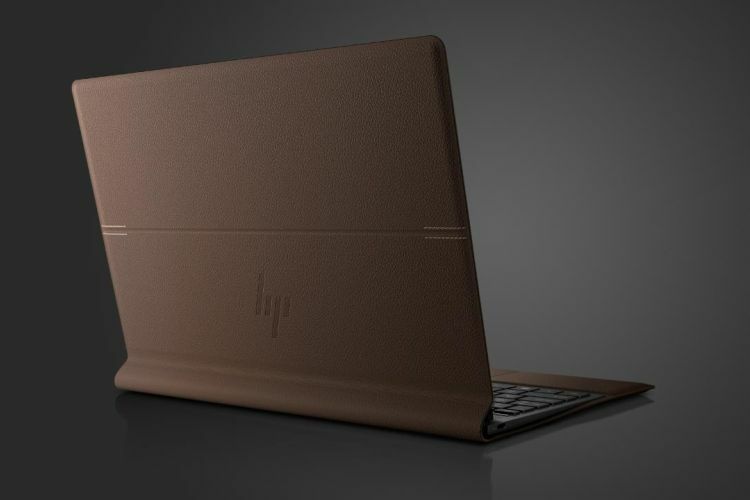 The leather body is made out of 100 percent chromed tan, full-grain leather, which HP claims is durable, while also adding a natural hinge which makes the new form factor possible. You can see the quintessential marks of leather-work such as the accented stitching and clamped edges. Spectre Folio will be available in Cognac Brown and Bordeaux Burgundy (from late December), which are not colors you usually associate with laptops either. These are ultra-premium laptops. The base variant has a Core i5 CPU and a starting price of $1,299.99 (Around Rs 93,000). The top-end model with Core i7 and LTE will go for $1,499.99 (Around Rs 1,20,000). 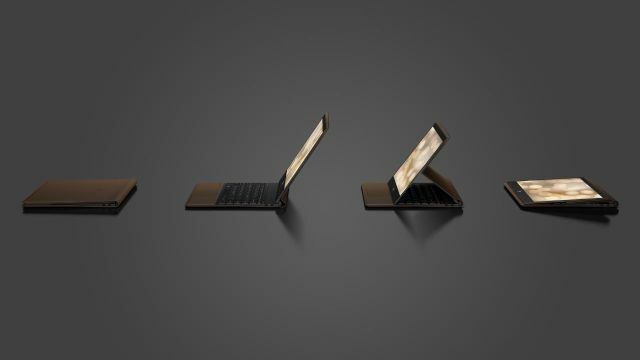 As a convertible or hybrid PC, the Spectre Folio can be used as a normal laptop, in a display-forward mode, which HP calls ‘Forward’ or as a tablet. The leather hinge and magnets allow users to bring the display forward and in front of the keyboard, with just the touchpad in front. The tablet mode is also a clever bit of design as you can simply press down on the hinge to fold the laptop inwards. The tablet doesn’t lie completely flat, which does improve ergonomics when it’s on a table. That’s necessary as the Folio has support for a pen and Windows Ink. HP also went with a radical new motherboard design where everything is laid out on a monolithic slab-like form factor. The Spectre Folio is powered by the ultra low voltage Y-series 8th Gen Intel Core i5 and i7 processors, with a fanless thermal design. HP claims the leather will create a better experience as it feels cool and comfortable in the lap. We are not so sure about – it might make things a bit sweaty if the laptop gets too hot. You can get the HP Spectre Folio with up to 16 GB of memory, up to 2 TB of PCIe NVME SSD. You can even get it with a 4K display, but for now HP will start with the 300-nits FHD display or a low-power, 1W 400-nits FHD panel. 4K is coming in late December, according to HP. Sound is piped out through 4 speakers tuned by Bang & Olufsen, as is the case in many other premium HP laptops. The other thing that really grabbed our attention – besides the leather exterior – is the claimed 18 hours of battery life. We suggest you consider that an exaggerated figure. Sure, under certain tests and with a certain display profile, you could probably get that, but it’s a tall claim and one which is likely to fall short in actual usage. It looks like an always-connected PC, and the Spectre Folio delivers on that count by being the world’s first gigabit-class LTE Intel-based laptop. The device also supports dual eSIM, and you can get it with an optional nano-SIM slot under the display and an optional embedded digital eSIM to quickly connect to cellular networks.That’s of course if carriers support it, which is unlikely to happen unless there’s an official launch in your market. For now, the Spectre Folio will be available in the US. Pre-orders for the HP Spectre Folio will begin October 1, 2018, at Best Buy.com and HP.com. It will be available at Best Buy in the US beginning October 29. HP is also launching accessories with the laptop; the Spectre Folio Pouch and the HP Spectre Folio Sleeve are expected to be available at HP.com next month for $49.99 and $69.99 respectively.